At Villa San Raffaello, guests are treated to stylishly restored farmhouse accommodation with pool, extensive landscaped gardens and absolutely stunning views. 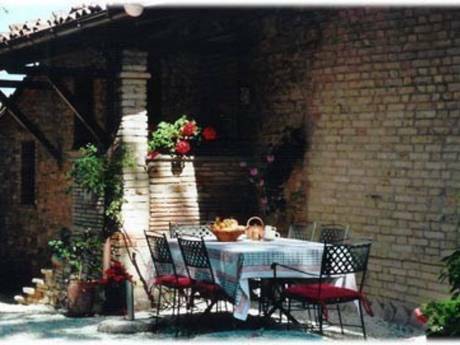 Our Le Marche villa has received great reviews an elegant base for magical holidays Exposed original stonework and high wooden ceilings characterise the warm, farmhouse feel of the first floor of the barn. The apartment's elevated position in our Le Marche Villa provides it with great views of the pool and the surrounding Marche countryside. There is a double bedroom and a twin bedroom, a bathroom with shower, lounge and a large kitchen dining room. The kitchen is well equipped with oven and hob, fridge freezer and dishwasher. 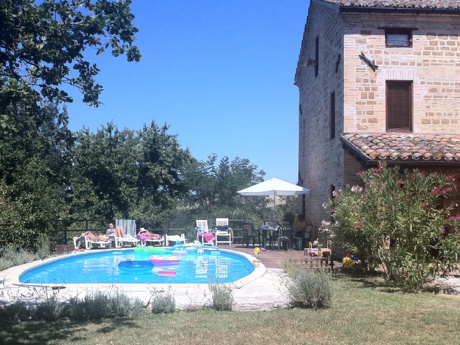 The lounge, featuring a wood burning stove, and a comfortable sofa bed, leads onto a large balcony, where you can eat alfresco in the evening sun and take in the stunning views of the medieval village of Sarnano & Sibillini mountains beyond.